Hello. I am Toby . I am a professional Trumpeter who is based in Putney. 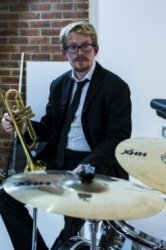 I perform in various ensembles ranging from jazz groups to big bands and often find myself in the theatres playing on shows. I specialise in Trumpet/Cornet tuition and (if desired), can even teach jazz. I teach all other brass instruments to at least grade v-vi standard too. I studied jazz trumpet at Leeds College of Music from 2006-2009 where I gained my Batchelor's degree. From there I joined the music corps of the British Army where I served over five years as a musician in the Royal Artillery Band and Orchestra. After my time in the army I became a free-lance musician performing and teaching across Kent and the south east. I have several years of experience teaching all ages and abilities in one-to-one settings or group lessons. Currently, I am now on a part time masters course at the Guildhall School of Music and Drama and teach several private pupils. My teaching experience goes back to when I was studying at Leeds College of Music (from 2006-2009) when I used to help teach at their Saturday music school. I often taught group classes here as well as one to one lessons and the students were aged between 11-17 years. My next teaching experience came from the army. When I was in the Royal Artillery Band I was often tasked with teaching various members of the army from different regiments. More often than not, infantrymen were required to learn the bugle or the cavalry trumpet for ceremonial occasions. They were sent to my band for a few days to learn how to play and form an embouchure so they could perform their bugle calls effectively. I took on several private pupils also whilst in the army. After leaving the army I took up teaching jobs in six schools across Kent including Dartford Grammar School, Sittingbourne Community College, Linton Park School Maidstone and Robert Napier School Medway. I took several pupils through graded exams and they achieved great success. One pupil in fact recently passed their grade two Cornet and passed with Merit. My approach to teaching is fairly simple and straight forward. There are two main aspects that I like to concentrate on which include breathing and embouchure. If these aspects are mastered then the rest falls into place. I especially like to look at these if you are learning the trumpet or french horn where the mouthpiece is a lot smaller than the bigger brass relatives. Whilst working on the technical side of things I like to look at what genre of music you maybe interested in. As I said previously I play jazz and do specialise in this area. However, if classical brass is for you then I can facilitate this also. I started off a classical player myself in brass bands and orchestras so I do know what the requirements are for these ensembles. Regardless of what musical area we would be looking at I do make a point of working on aural perception skills and harmonic knowledge. For instance, I think every musician needs to know scales and be able to at least hum or sing the music they are to be playing. Being able to sing your part is important and if your knowledge of scales and arpeggios is good then you can play anything. Finally, I like people to have fun! If you don't enjoy what you are doing then there is no point. I always try to make lessons stimulating, challenging and enjoyable. Brass playing is hard but with the right work ethic and enjoyment it can be very rewarding.